The N.C. Chronicles. 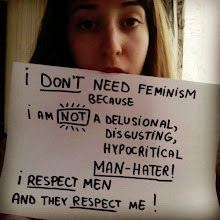 : The slow death of feminism and their manginas. That said, seems to me that women in general are satisfied with who they are and are fully capable of deciding for themselves which path they want to take. Without the help of those who "hate" been women, namely the local Hagasaurus Parasiticus Petacatosaurus, aka the lowly feminist. I and so many of us have always supported anyone in our families to be independent, to think for themselves, as a native Canadian, the very idea of controlling the path of another human being is unthinkable. I cannot speak for others, only what I was thought, that we are all a strand in the web of life and if one controls another, that persons gifts are lost forever. I personally think, if we look deeply, feminism has run its course, if it was ever a course to be taken seriously in the first place, true they are still a problem, but in the long term it does not look good for them to hang on to their power much longer. Their main mistake is that they tagged all men as born abusers and rapists and forgot that men are "mostly" raised by their mother, and this idealism insulted the hell out of women who realise they do not raise their sons to abuse women.